Portable modular dance floors are mobile dance floors which create a temporary solid surface for dancing and special event use. 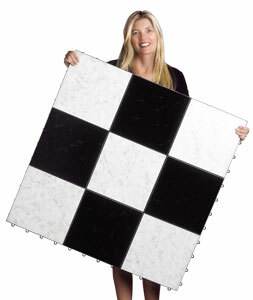 Typically, they are installed by laying down panels to create a custom size dance floor. Depending on the type of floor system, they can be used for both indoor and outdoor use. The portable dance floor industry includes event rental companies, hotels, event halls, and retail consumers looking for a temporary practice dance floor. Originally, portable dance floors were typically manufactured from wood and metal framing, which made for very heavy panels prone to warping and damage when used outdoors. Portable wood dance floors were also very costly. Then around 1989, the invention of portable modular dance floors were created by Kerry Moller of SnapLock industries. SnapLock Dance floors are made of a polypropylene base with various commercial grade laminate top surfaces that look like wood. These floors are extremely durable, require no resurfacing, and are 100% waterproof. The SnapLock floors use a no-tool patented interlocking system for a simple connection of panels. These low cost and high quality dance floors are manufactured in Salt Lake City, Utah. Today, modular portable dance floors are the most popular choice for the event rental and hospitality industries around the world. SnapLock also created other markets for these floors, which include temporary practice dance floors, aerobic floors, temporary tap dance floors, and many more. Because of the ease of portability and wide variety of uses, a modular dance floor is a great investment that pays for itself!